Are you wondering if your pool is safe for your furry friend? Well we have the answers to your questions. This blog post is filled with tips and advice for you and your pup to have fun and stay safe in healthy crystal clear water. Will chlorine hurt my dog? Nope! In fact, chlorine pool is as safe for your dog as it is for you! However, do not let your pet drink the water, they can get an upset stomach from doing so. Also, please remember to rinse off your pet after they get out of the pool. Some animals can be allergic to chlorine so keep a close eye on them the first few times they get into the pool. Remember to always get your filter clean done every 4-5 months or more. A dog swimming in the pool is equivalent to about 50 humans in the pool. We recommend you keep your pool and filter clean so it does not hard you or your pets. This also includes keeping your equipment up and running. If you need help with a pool equipment repair or pool cleaning service do not be hesitant to call for help. Will Bromine hurt my dog? No, it will not (unless they are allergic, as mentioned above)! Bromine is just another form of Chlorine but is mostly used in indoor pools because it does not smell as bad as chlorine. If used in outdoor pools, it will not last as long due to sun exposure. In fact, salt-water pools are safe for pets as well. Just remember to check for allergies before you let them get into a pool! Dogs with health diseases such as heart and kidney, and those eating salt restricted diets should avoid drinking from salt-water pools. We would highly recommend talking to your veterinarian before letting your pet swim. These are three main types of pool, and your furry friend can go into any of them. Can I let my pet swim in a slightly green pool? No, we would not recommend it at all. Just as if you would not like swimming in a pool with algae, we would not want your pup to be swimming with algae. However, we would recommend getting a green to clean done quick before it causes any more problems such as black algae or a drain and acid wash.
What if my equipment is not running? Can my pets still swim? It all depends on the water condition. If the water is not clear and blue then we would suggest for you to hold your pets away from the water. If your equipment is not working, try seeing if it is something that you can fix, if not, call a local pool maintenance and repair company. We want your pet swimming in the pool if it is safe for you to swim in the pool. Could I use a small kiddie pool for my dog? Absolutely! However, filtration and clean water is very important so we would highly recommend dumping out the water after use and filling it up with new water the next time you use it. Treat your pupper as you would treat a small child, you do not want them swimming in bacteria filled water. We recommend staying away from inflatable pools as your pup might want to chew or paw it. Here is a doggie pool we would recommend! SAFETY FIRST! Try getting your pup a dog life vest! Many times you want to take your dog to the lake or camping with you and a dog vest as well as a rinse off after the swim would be highly recommended. Here is a vest that is recommended by pup owners. Dogs with shorter legs have a harder time staying afloat so be sure to get them one before letting them go into the water. If your dog has floppy ears, please be careful as they are more prone to ear infections. Give your dog some fresh drinking water before he/she gets into the pool to prevent them from drinking pool water. Although, it is safe for them to drink pool water – it may cause an upset stomach. 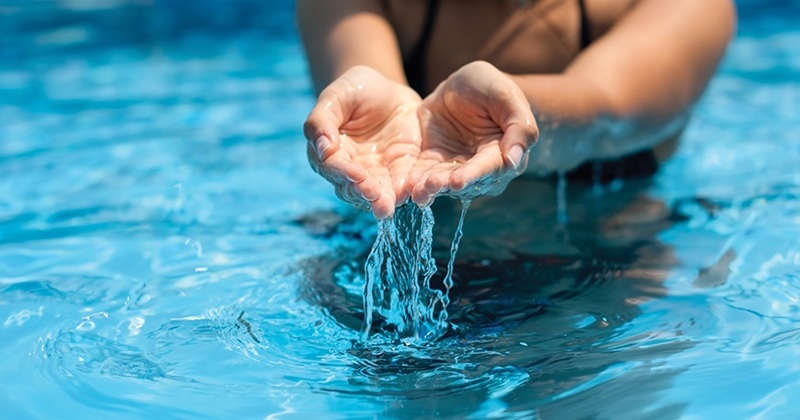 If your pool is a salt water pool, the water will not be safe for them to drink as it may cause dehydration, vomiting, and diarrhea. A dog swimming in the pool is equivalent to about 50 humans in the pool. This may cause your filter to be cleans more often than 6 months. If it is your pups first time in the water, you might want to go into the water with them and help them swim. It might be a little hard if they are squirmish but it will be best for both parties in the long haul. 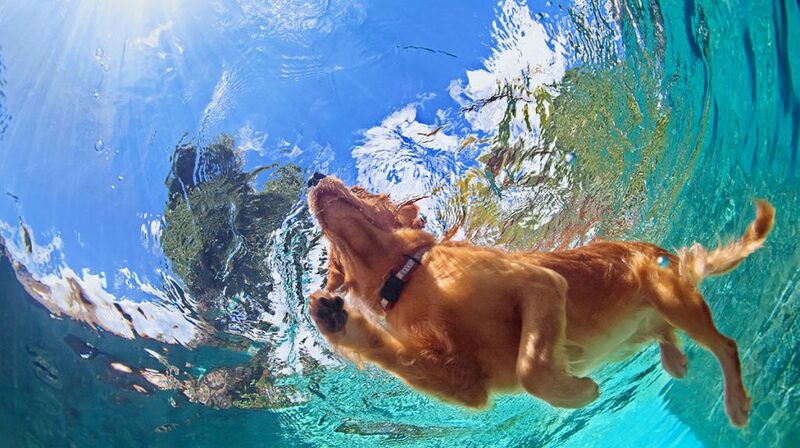 Swimming is a great pass time and a way to work out for both you and your pet. 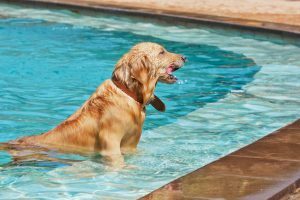 Many times vets will tell owners to let their older dogs with problems walking, swim in the pool for a bit because they will find comfort in pools that have the proper water height. Also remember to not let your furry friend swim during the winter time unless you have a pool heater. Your pool is perfectly safe for you and your pet if you keep in mind the basics that we have recommended above. And remember sharing is caring… You can use the following links to post this article up on your favorite social media platform and share the information with your friends!